The Congo Diamond Tiara belonged originally to Princess Josephine Charlotte of Belgium and it was first seen when she married Jean of Luxembourg on April 9th 1953. The diamonds were said to possibly have been a gift from the bride's father, Leopold III, who had abdicated his throne two years earlier. There are rows of round cut diamonds in this creation with a line of baguette cut stones between them. It is a slim and subtle tiara and was worn by both Josephine Charlotte and Maria Teresa towards the middle of their heads with thin veils attached behind it. The tiara was also used by Josephine-Charlotte's two daughters for their weddings. Princess Marie-Astrid wore it less than a year after Maria Teresa when she married Archduke Carl Christian of Austria in Luxembourg on February 6th 1982. 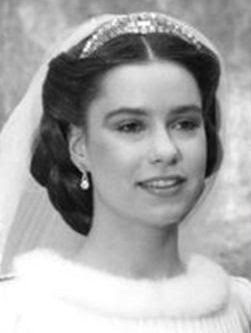 Just five weeks later, the tiara was worn by Marie-Astrid's sister, Princess Margaretha, when she wed Prince Nikolaus of Liechtenstein on March 20th 1982. The wedding tradition of this tiara seems to have ended there as the next generation of Luxembourg royals haven't used it. So its most famous outing in modern times remains the moment that Maria Teresa wore it for her Valentine's Day Wedding in 1981.